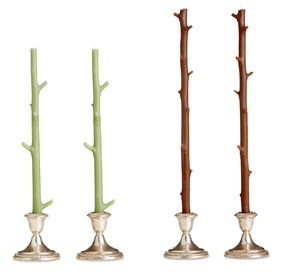 Well, I have to say I am really digging the great candles from the fine folks at Stick Candles – candles that are cast from – and look like – sticks found in nature. Not only are Stick Candles fine quality candles – they look great just standing in your candlesticks and make a nice accessory for any décor (and a mighty fine gift I might add). Learn more and fine Stick Candles here. When I was a kid, my mom would always make homemade chicken soup on Halloween. I guess the idea was to keep us warm and well fed for trick-or-treating. But it was the side dish she made that I looked forward to most: Cornbread. 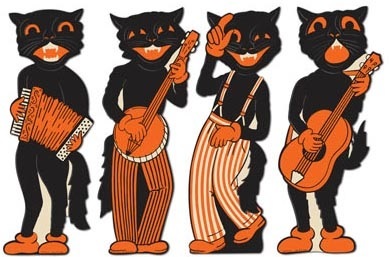 I loved her cornbread and as Halloween approaches I can almost smell it in the air. Well, this year I found the perfect thing to honor this cherished tradition while making it new: this recipe for Double Pumpkin Cornbread with Red Onion I found from the fine pages of Good Housekeeping magazine. 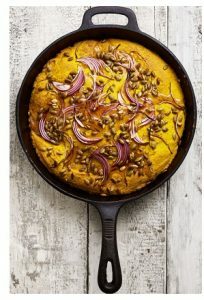 Find the recipe for Double Pumpkin Cornbread with Red Onion from Good Housekeeping here. See all the recipes and other household tips from Good Housekeeping here. It’s that time of year again, when kids will be going door-to-door to help raise fund for their less fortunate peers around the world with Trick-or-Treat for UNICEF. 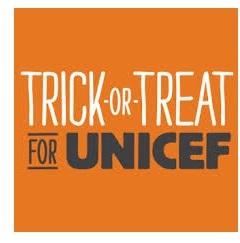 Learn more about Trick-or-Treat for UNICEF and how you can support this great event here. Well Halloween is this coming Tuesday and if you meant to send a special holiday surprise to someone, you are running out of time. But fear not… Here are a couple of ideas for gifts that you can still get to your special little goblins in plenty of time. Find the Bootastic Bouquet from Edible Arrangements here. 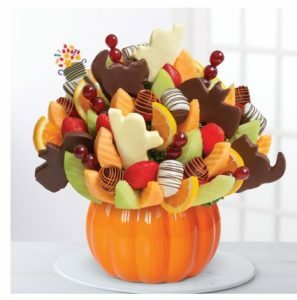 See all the fall-inspired bouquets and gifts from Edible Arrangements here. 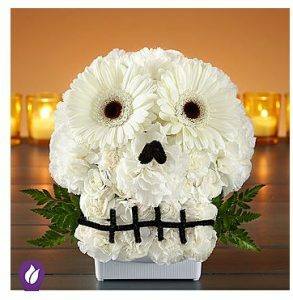 Find the Spooky Skull Flower Arrangement from 1-800-Flowers here. See all the fall-inspired bouquets and gifts from 1-800-Flowers here. 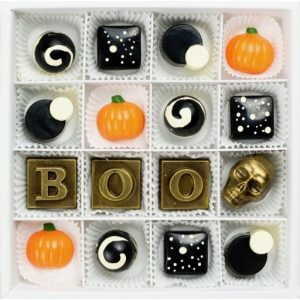 If the bulk Halloween candy you buy at the supermarket is not quite good enough for that special trick-or-treater in your life, kick it up a few notches and get them the Eat, Drink & Be Scary collection I found from the fine folks at Maggie Louise Confections. Find the Eat, Drink & Be Scary collection from Maggie Louise Confections here. Learn more and see all the fine products from Maggie Louise Confections here. 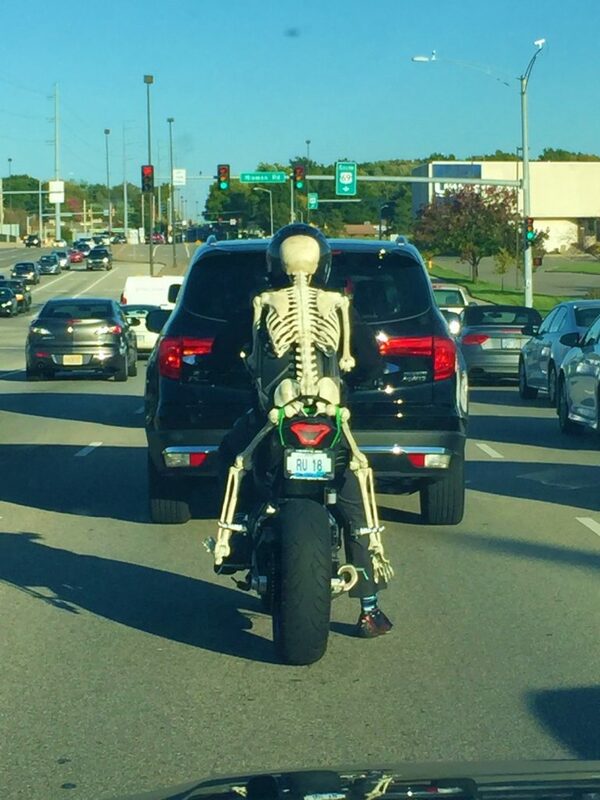 A sign of the season: I pulled up behind this scene on my way home from work the other night – a fully articulated skeleton mounted on the back of this motorcyclist. It was pretty cool – the photo doesn’t do it justice. 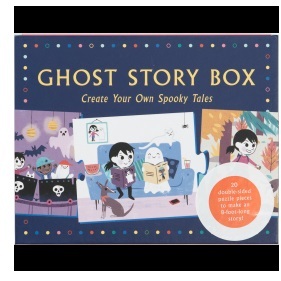 Just in time for Halloween next week comes the creative Ghost Story Box: Create Your Own Spooky Tales by Magma and Ella Bailey. The Ghost Story Box is the perfect way to keep your kids active, creative and, well, scared for the spooky season. After making a few spooky tales with the Ghost Story Box, maybe your kids will be inspired to write their own stories and maybe be the next Stephen King or Anne Rice. Ghost Story Box: Create Your Own Spooky Tales by Magma and Ella Bailey is available from Amazon and other fine booksellers. 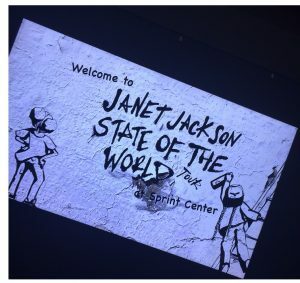 Last week I had the awesome opportunity to catch the great Janet Jackson’s State of the World tour at Kansas City’s Sprint Center – and it was as great as you would expect it to be. 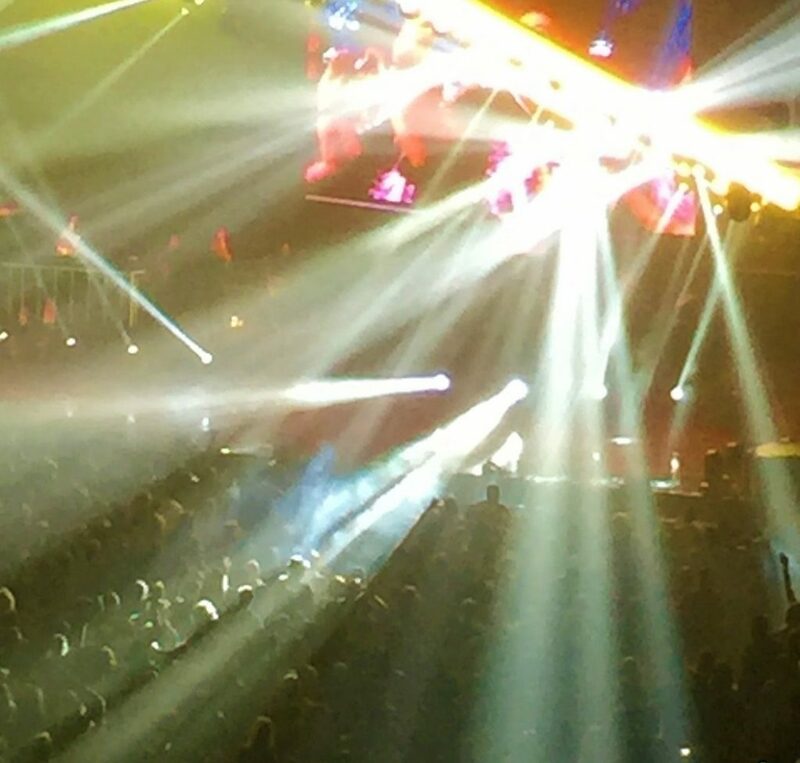 Anyway, the show was excellent, the dancing was stellar, and Janet (Miss Jackson if you’re nasty) was in great form, but I was transfixed by the amazing lighting apparatus that dominated the stage – as my bit of an artsy photo below only hints at. I am not sure about the state of the world, but I am happy to report the state of the Rhythm Nation is excellent. Miss Jackson continues the current leg of her North American tour through December, including stops in, ahem, Boston and Providence. 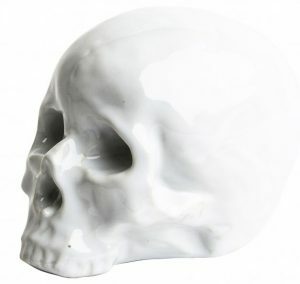 All skulls are kind of creepy, but I have to say the Memorabilia Porcelain Skull I found from the fine folks at Jung Lee is particularly so – and the perfect find for the Halloween season. Find the Memorabilia Porcelain Skull from Jung Lee here. See all the great finds from Jung Lee here. Lost Cowboy is powered by	WordPress 5.0.4 and delivered to you in 0.904 seconds using 58 queries.